We all give presentations. We write and review papers. Either way, we have to be critical of our data and how it is presented to others, both numerically and graphically. With that said, I thought it would be nice to start this year with a couple of quick tips or notes that can help with mistakes I see frequently. The most common thing I see is poorly documented cleanup routines and partitioning. Between the initial collection and final presentation of the data, a lot of things are done to that data. It needs to be clear what was done so that one can interpret it correctly (or other people can reproduce it). Cleanup routines can change the data in ways that can either be subtle (or not so subtle), but more importantly they could wrongly change your conclusions. The easiest routine to see this on is the grain dilation routine. This routine can turn noisy data into a textured dataset pretty fast (fig. 1). Figure 1. The initial data was just pure noise. By running it iteratively through the grain dilation routine, you can make both grains and textures. Luckily for us, OIM Analysis™ keeps track of most of what is done via the cleanup routines and partitioning in the summary window on either the dataset level or the partition level (fig. 2). Figure 2. A partial screenshot of the dataset level summary window shows cleanup routines completed on the dataset, as well as the parameters used. This makes your processing easily repeatable. The other common issue is not including the full information needed to interpret a map. 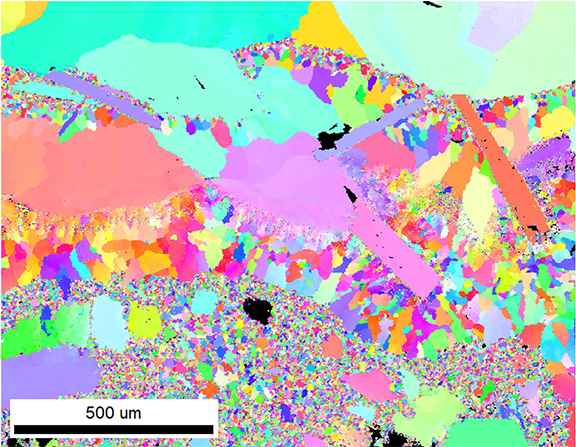 I really need to look at 3 things to get the full picture for an EBSD dataset: the IPF map (fig. 3), the Phase Map (fig. 4) and the IPF Legend (fig. 5) of those phases. This is very important because while the colors used are the same, the orientations differ between the different crystal symmetries. Figure 3. General IPF Map of a geological sample. Many phases are present, but the dataset is not complete without a legend and phase map. The colors mean nothing without knowing both the phase and the IPF legend to use for that phase. Below is a multiple phase sample with many crystal symmetries. All use Red-Green-Blue as the general color scheme. By just looking at the general IPF map (fig. 3), I can easily get the wrong impression. Without the phase map, I do not know which legend I should be using to understand the orientation of each phase. Without the crystal symmetry specific legend, I do not know how the colors change over the orientation space. I really need all these legends/maps to truly understand what I am looking at. One missing brick and the tower crumbles. Figure 5. With all the information now presented, I can actually go back and interpret figure 3 using figures 4 and 5 to guide me. Figure 4. In this multiphase sample, multiple symmetries are present. I need to know which phase a pixel is, to know which legend to use. Being aware of these two simple ideas alone can help you to better present your data to any audience. The fewer the questions about how you got the data, the more time you will have to answer more meaningful questions about what the data actually means! Consider the case where you not only want to characterize the texture of a material but also the grain size or some other microstructural characteristic requiring a relatively fine microstructure relative to the grain size. According to some previous work, to accurately capture the texture you will want to measure approximately 10,000 grains  and about 500 pixels per average grain in order to capture the grain size well . This would result in a scan with approximately 5 million datapoints. Instead of calculating the texture using all 5 million data points, you can use a sub-set of the points to speed up the calculation. In our latest release of OIM Analysis, this is not as big of a concern as it once was as the texture calculations have been multithreaded so they are fast even for very large datasets. Nonetheless, since it is very likely that you will want to calculate the grain size, you can use the area weighted average grain orientation for each grain as opposed to using all 5 million individual orientation measurements for some quick texture calculation. Alternatively, a sub-set of the points through random or uniform sampling of the points in the scan area could be used. Of course, you may wonder how well the sub-sampling works. I have done a little study on a threaded rod from a local hardware store to test these ideas. The material exhibits a (110) fiber texture as can be seen in the Normal Direction IPF map and accompanying (110) pole figure. For these measurements I have simply done a normalized squared difference point-by-point through the Orientation Distribution Function (ODF) which we call the Texture Difference Index (TDI) in the software. 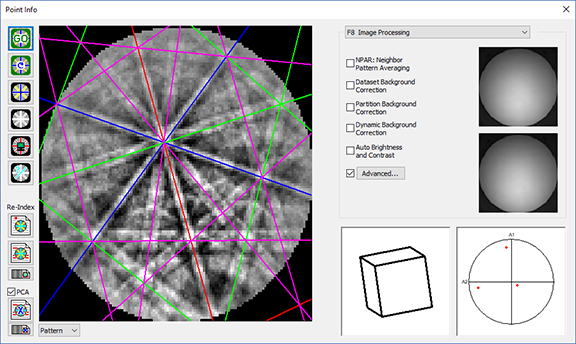 This is a good method because it allows us to compare textures calculated using different methods (e.g. series expansion vs binning). In this study, I have used the general spherical harmonics series expansion with a rank of L = 22 and a Gaussian half-width of  = 0.1°. The dataset has 105,287 points with 92.5% of those having a CI > 0.2 after CI Standardization. I have elected only to use points with CI > 0.2. The results are shown in the following figure. As the step size is relatively coarse with respect to the grain size, I have experimented with using grains requiring at least two pixels before considering a set of similarly oriented points a grain versus allowing a single pixel to be a grain. This resulted in 9981 grains and 25,437 grains respectively. In both cases, the differences in the textures between these two grain-based sub-sampling approaches with respect to using the full dataset are small with the 1 pixel grain based sub-sampling being slight closer as would be expected. However, the figure above raised two questions for me: (1) what do the TDI numbers mean and (2) why do the random and the uniform sampling grids differ so much, particularly as the number of points in the sub-sampling gets large (i.e. at 25% of the dataset). The pole figure for the 1000 random points in the previous figure certainly captures some of the characteristics of the pole figure for the full dataset. Is this reflected in the TDI measurements? My guess is that if I were to calculate the textures at a lesser rank, something like L = 8 then the TDI’s would go down. This is already part of the TDI calculation and so it is an easy thing to examine. For comparison I have chosen to look at four different datasets: (a) all of the data in the dataset above (named “fine”), (b) a dataset from the same material with a coarser step size (“coarse”) containing approximately 150,000 data points, (c) sub-sampling of the original dataset using 1000 randomly sampled datapoints (“fine-1000”) and (d) the “coarse” dataset rotated 90 degrees about the vertical axis in the pole figures (“coarse-rotated”). It is interesting to note that the textures that are similar “by-eye” show a general increase in the TDI as the series expansion rate increases. However, for very dissimilar textures (i.e “coarse” vs “coarse-rotated”) the jump to a large TDI is immediate. The differences between the random and uniform sampling were a bit curious so I decided to check the random points to see how they were positioned in the x-y space of the scan. 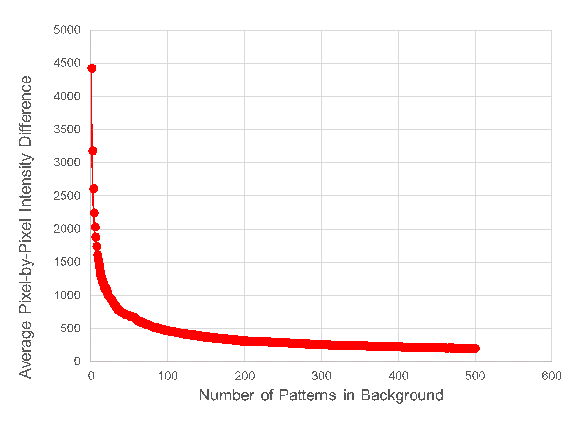 The figure below compares the uniform and random sampling for 4000 datapoints – any more than this is hard to show. Clearly the random sampling is reasonable but does show a bit of clustering and gaps within the scan area. Some of these small differences show up with higher differences in TDI values than I would expect. Clearly, at L = 22 we are picking up quite subtle differences – at least subtle with respect to my personal “by-eye” judgement. It seems to me, that my “by-eye” judgement is biased toward lower rank series expansions. Of course, another conclusion would be that my eyesight is getting rank with age ☹ I guess that explains my increasingly frequent need to reach for my reading glasses. SI Wright (2010) “A Parametric Study of Electron Backscatter Diffraction based Grain Size Measurements”. Practical Metallography, 47, 16-33. Figure 1. 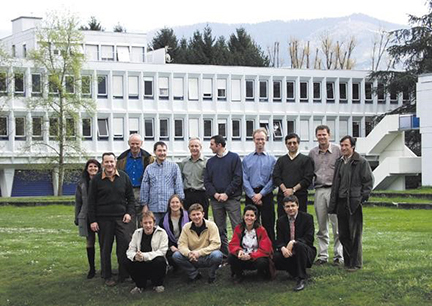 Participants of my first EBSD training course in Grenoble in 2001. Everybody is learning all the time. You start as a child at home and later in school and that never ends. In your professional career you will learn on the job and sometimes you will get the opportunity to get a dedicated training on some aspect of your work. I am fortunate that my job at EDAX involves a bit of this type of training for our customers interested in EBSD. Somehow, I have already found myself teaching for a long time without really aiming for it. Already as a teenager when I worked at a small local television station in The Netherlands I used to teach the technical things related to making television programs like handling cameras, lighting, editing – basically everything just as long as it was out of the spotlight. Then during my geology study, I assisted in teaching students a variety of subjects ranging from palaeontology to physics and geological fieldwork in the Spanish Pyrenees. 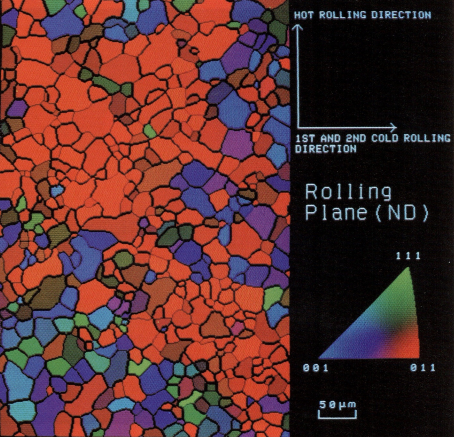 So, unsurprisingly, shortly after joining EDAX in 2001 when I was supposed to simply participate in an introductory EBSD course (fig 1) taught by Dr. Stuart Wright in Grenoble, France, I quickly found myself explaining things to the other participants instead of just listening. Teaching about EBSD often begins when I do a presentation or demonstration for someone new to the technique. 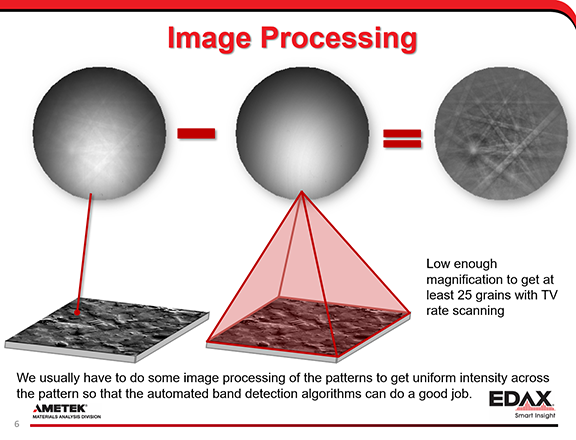 And the capabilities of EBSD are such that just listing the technical specifications of an EBSD system to a new customer does not do it justice. Later when a system has been installed I meet the customers again for the dedicated training courses and workshops that we organise and participate in all over the world. Figure 2. 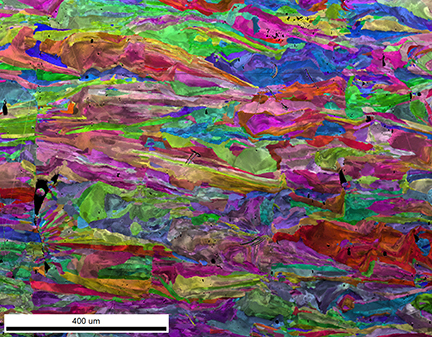 EBSD IPF map of Al kitchen foil collected without any additional specimen preparation. The colour-coding illustrates the extreme deformation by rolling. In such presentations, of course we talk about the basics of the method and the characteristics of the EDAX systems, but then it always moves on to how it can help understand the materials and processes that the customer is working with. There, teaching starts working the other way as well. With every customer visit I learn something more about the physical world around us. Sometimes this is about a fundamental understanding of a physical process that I have never even heard of. At other times it is about ordinary items that we see or use in our daily lives such as aluminium kitchen foil, glass panes with special coatings, or the structure of biological materials like eggs, bone, or shells. Aluminium foil is a beautiful material that is readily available in most labs and I use it occasionally to show EBSD grain and texture analysis when I do not have a suitable polished sample with me (fig 2) and at some point, a customer explained to me in detail how it was produced in a double layer back to back to get one shiny and one matte side. 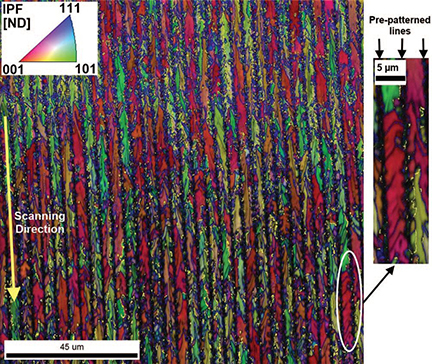 And that explained why it produces EBSD patterns without any additional preparation. Something new learned again. Figure 3. IPF map of austenitic steel microstructure prepared by additive manufacturing. A relatively new development is additive manufacturing or 3D printing where a precursor powdered material is melted into place by a laser to create complex components/shapes as a single piece. This method produces fantastically intricate structures (fig 3) that need to be studied to optimise the processing. With every new application my mind starts turning to identify specific functions in the software that would be especially relevant to its understanding. In some cases, this then turns into a collaborative effort to produce scientific publications on a wide variety of subjects e.g. on zeolite pore structures (1, fig (4)), poly-GeSi films (2, fig (5)), or directional solidification by biomineralization of mollusc shells (3). Figure 4. 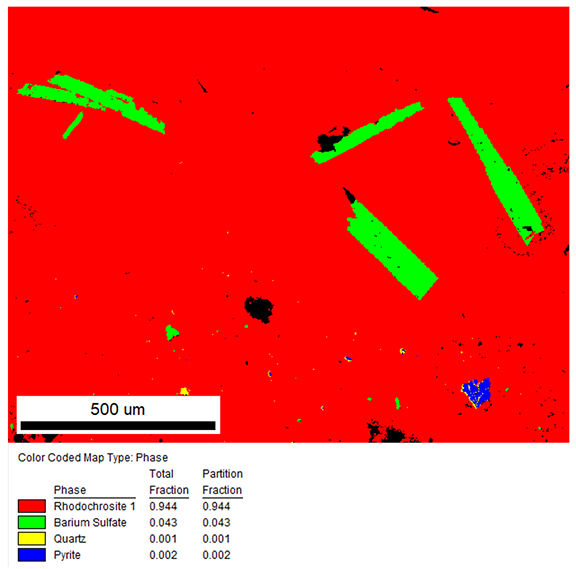 Figure taken from ref.1 showing EBSD analysis of zeolite crystals. Figure 5. 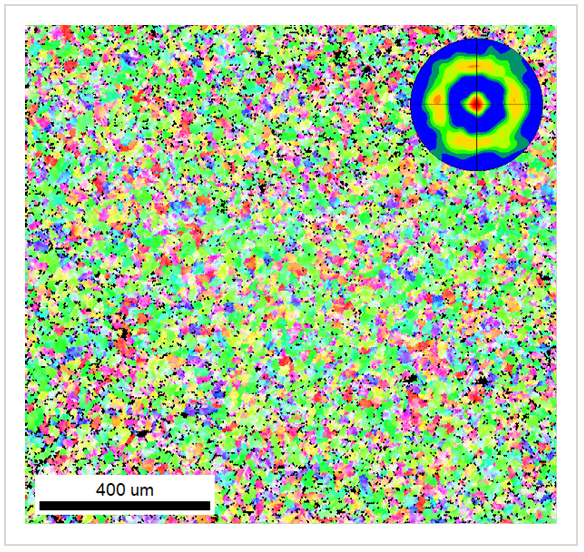 Figure taken from ref.2 showing laser crystallised GeSi layer on substrate. Such collaborations continuously spark my curiosity and it is because of these kinds of discussions that after 17 years I am still fascinated with the EBSD technique and its applications. This fascination also shows during the EBSD operator schools that I teach. The teaching materials that I use slowly evolve with time as the systems change, but still the courses are not simply repetitions. Each time customers bring their own materials and experiences that we use to show the applications and discuss best practices. I feel that it is true that you only really learn how to do something when you teach it. This variation in applications often enables me to fully show the extent of the analytical capabilities in the OIM Analysis™ software and that is something that often gets lost in the years after a system has been installed. I have seen many times that when a new system is installed, the users invest a lot of time and effort in getting familiar with the system in order to get the most out of it. However, with time the staff that has been originally trained on the equipment moves on and new people are introduced to electron microscopy and all that comes with it. The original users then train their successor in the use of the system and inevitably something is lost at this point. When you are highly familiar with performing your own analysis, you tend to focus on the bits of the software and settings that you need to perform your analysis. The bits that you do not use fade away and are not taught to the new user. This is something that I see regularly during the training course that I teach. Of course, there are the new functions that have been implemented in the software that users have not seen before, but people who have been using the system for years and are very familiar with the general operation always find new ways of doing things and discover new functions that could have helped them with past projects during the training courses. 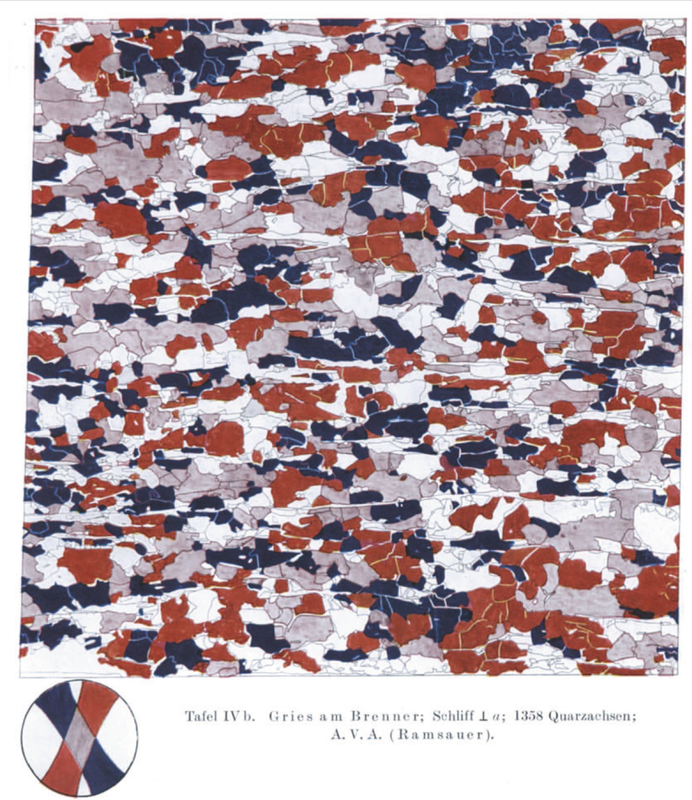 During the latest EBSD course in Germany in September a participant from a site where they have had EBSD for many years remarked that he was going to recommend coming to a course to his colleagues who have been using the system for a long time as he had found that the system could do much more than he had imagined. 1) J Am Chem Soc. 2008 Oct 15;130(41):13516-7. doi: 10.1021/ja8048767. Epub 2008 Sep 19. One of the first scientific conferences I had the good fortune of attending was the Eighth International Conference on Textures of Materials (ICOTOM 8) held in 1987 in Santa Fe, New Mexico. 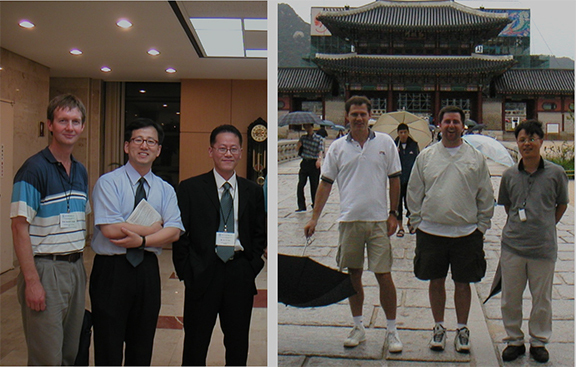 I was an undergraduate student at the time and had recently joined Professor Brent Adams’ research group at Brigham Young University (BYU) in Provo, Utah. It was quite an introduction to texture analysis. Most of the talks went right over my head but the conference would affect the direction my educational and professional life would take. Professor Adams’ research at the time was focused on orientation correlation functions. While his formulation of the equations used to describe these correlations was coming along nicely, the experimental side was quite challenging. One of my tasks for the research group was to explore using etch pits to measure orientations on a grain-by-grain basis. It was a daunting proposition for an inexperienced student. At the ICOTOM in Santa Fe, Brent happened to catch a talk by a Professor from the University of Bristol named David Dingley. David introduced the ICOTOM community to Electron Backscatter Diffraction (EBSD) in the SEM. Brent immediately saw this as a potential experimental solution to his vision for a statistical description of the spatial arrangement of grain orientations in polycrystalline microstructures. After returning to BYU, Brent quickly went about preparing to get David to BYU to install the first EBSD system in North America. Instead of etch pits, my Master’s degree became comparing textures measured by EBSD and those measured with traditional X-Ray Pole Figures. 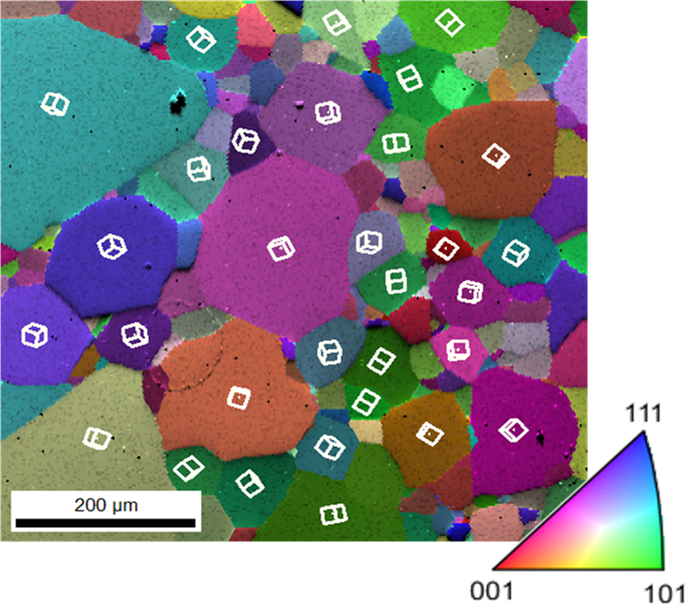 I had the opportunity to make some of the first EBSD measurements with David’s system. From those early beginnings, Brent’s group moved to Yale University where we successfully built an automated EBSD system laying the groundwork for the commercial EBSD systems we use today. I’ve had the good fortune to attend every ICOTOM since that one in Santa Fe over 30 years ago now. 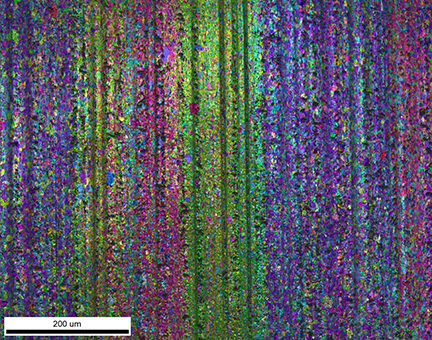 The ICOTOM community has helped germinate and incubate EBSD and continues to be a strong supporter of the technique. 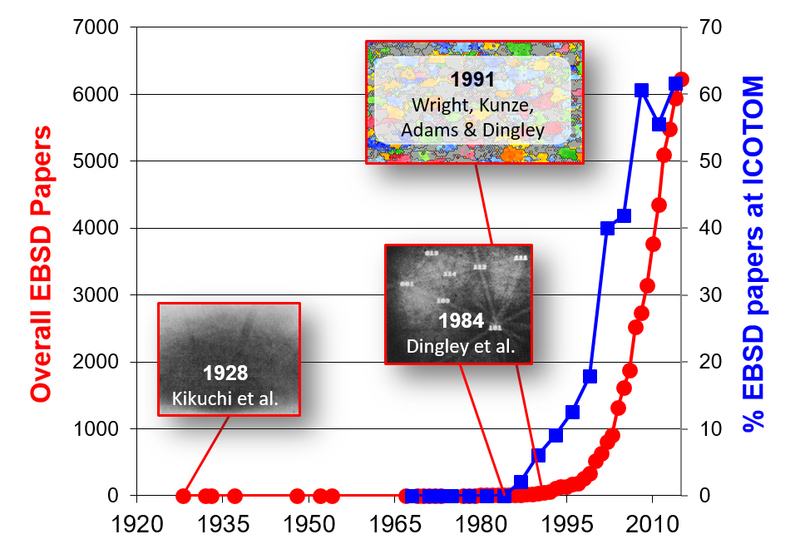 This is evident in the immediate rise in the number of texture studies undertaken using EBSD immediately after EBSD was introduced to the ICOTOM community. Things have a way of coming full circle and now I am part of a group of three (with David Fullwood of BYU and my colleague Matt Nowell of EDAX) whose turn it is to host the next ICOTOM in St George Utah in November 2017. The ICOTOM meetings are held every three years and generally rotate between Europe, the Americas and Asia. At ICOTOM 18 we will be celebrating 25 years since our first papers were published using OIM.